That is the real question we’re all asking ourselves this closet-cleaning season. Mountains of clothing, shoes, and bags were scattered across my room last night as I took on the hefty task of cleaning out my closet. I cleared out my shelves and discovered clothes that I didn’t even know I had. It was kind of like finding them for the first time all over again. I guess you could say I’m currently working on my PhD in Retail Therapy. Think of cleaning out your closet like a fashion detox. You go in and get rid of what you don’t need. 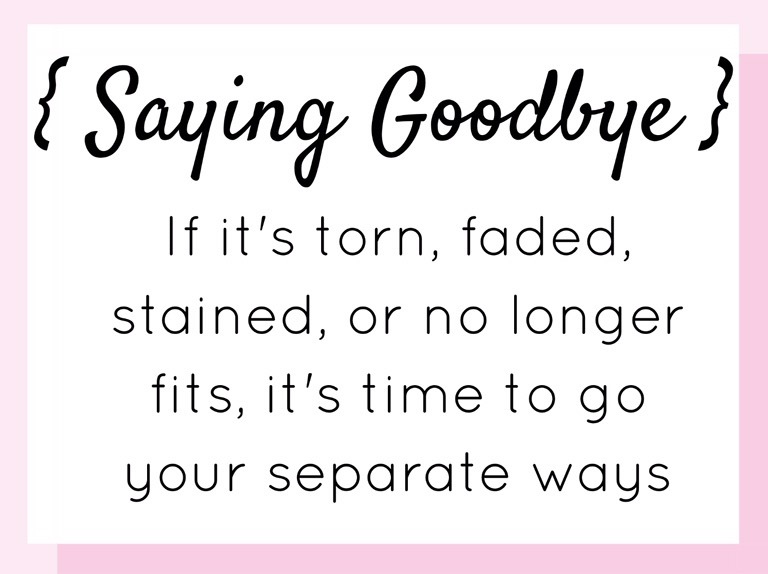 If you can’t decide wether or not to keep something, just remember: if it’s torn, faded, stained, or no longer fits, it’s time to go your separate ways. That is, of course, unless it’s vintage or distressed on purpose like ripped skinny jeans and things of that sort. Rips and tears in the right places can really accentuate certain pieces and looks but stains are a major no no. Unless it ends up the pajama department because we all know that’s where old tees and sweatshirts are laid to rest. This should go without saying, but if it doesn’t fit, DON’T WEAR IT. If you do, you’re going to end up looking 10lbs. heavier or like you’re wearing a lumpy tablecloth. Buying clothes that fit correctly is so important because no one wants their pants falling down or ripping at the seams. Time to sort everything out. 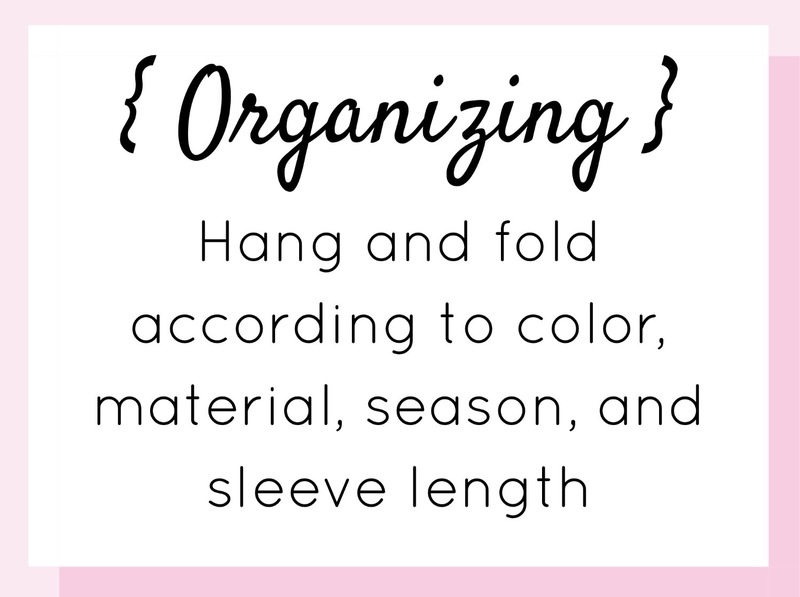 Hang and fold according to color, material, season, and sleeve length. Now that the weather is cooling down, my fall and winter clothes have moved to the front of my closet and my summer clothes have all been put away. I usually hang my shirts according to color, from short-sleeved to long-sleeved. Other things like jackets, dresses, pants, sweaters, and skirts have their own little sections as well. My shoes are all aligned on the floor of my closet and most of my purses are sitting on the upper shelves. Having everything in a specific spot makes it a lot easier and less time consuming to pick out outfits especially when you’re running behind or don’t have a lot of time. Now you’re left with neatly folded clothes, organized shoes, and everything is in its place. 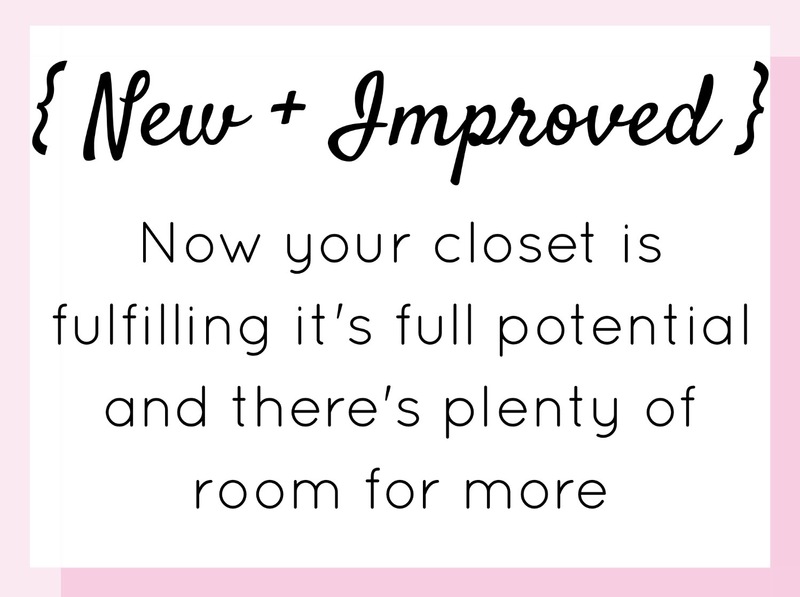 Or at least until you try on everything you own, throw it all on the floor, and come to the conclusion, “I have nothing to wear”. Been there done that, am I right? Did someone say “shopping spree”? Now it’s time to go and restock your closet with this season’s must-have clothes and add a few kicks to your killer shoe collection. Or, if you’re like me and still have clothes piled up in the corner, hanging over the back of a chair, or shoved under your bed, put them away. I know I’m guilty of not always putting my clothes where they’re supposed to go. Most of the time I’m just too lazy or too tired to walk all the way to my closet, look for a hanger, hang up my clothes, and then walk all the way back to my bed. That’s just too much work for one day.